In an obscure part of the world there is a little town called Benoni. (Funny name, dull town. You've never been there.) In 1975 the town was served by a local newspaper called the City Times. It was a weekly rag with little merit and no news, and we never missed a copy. Ever. As a high school senior, my friend Windsor seemed really old. He'd been out of school for 3 years and had a car and an apartment and a job on the City times. And among other things, Windsor was the town's music critic. In 1975, even in sleepy little Benoni, progressive rock was at its peak � and Windsor knew it. He got to choose which albums he would review, he got the LPs for free, and we all got to make cassette copies. If Windsor recommended music, you knew it would be good. Late in 1975, after I'd finished a Saturday afternoon shift waiting tables at the Penny Farthing Pancake Palace. I went to the record shop next door and rummaged through their bargain bin and found an LP with beautiful cover art called The Snow Goose by Camel. It cost just forty nine cents, and Windsor had mentioned Camel but couldn't find any of their music, so I parted with that day's tips and carted the album home without much anticipation. It took just one spin for me to become lifelong Camel fan, and I quickly became a connoisseur of concept albums. The album's concept was based on a heartfelt story. Well known New York writer Paul Gallico wrote a literary children's novella about the WW-II evacuation of troops from Dunkirk. It was first published in the Saturday Evening Post in Nov. 1940, and won the O.Henry prize in 1941. 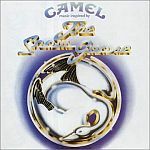 In 1975, Andy Latimer and the late Pete Bardens had an obscure little band called Camel, and with the aid of the London Symphony Orchestra, produced an instrumental concept album based on the story. It was a brilliant example of rock themes interwoven perfectly into a classical soundscape. Gallico, a non smoker, sued the band for breach of copyright � although we understand that he actually believed the name "Camel" would promote the cigarette brand. Under the settlement the band had to hand over part of their royalties and the album was renamed from The Snow Goose, which I bought in Benoni, to Music Inspired By The Snow Goose, which I re-purchased from Amazon. Track 1 is "The Great Marsh": The story begins in 1930, and is set in Chelmbury, in the desolate marshlands of Essex, on the east coast of England. Camel describes this piece as "just before dawn till sunrise". A soft 2-note synthesizer motif and a choir of ethereal female vocals build up a sense of anticipation over 2 minutes, with the faint sounds of waterbirds in the background. In the last 30 seconds one of the important musical themes is introduced. "Rhayader": Artist Philip Rhayader, in his late twenties, is a hunchback with a crippled left arm. He lives as a lonely recluse in an old abandoned lighthouse, where he paints the marsh and the waterfowl that inhabit it. This is a 3 minute piece featuring piano and flute, playing a theme that will permeate the album in several guises. This is followed by bass guitar and drums, then deep keyboards re-visit the theme, and revert back to the soft piano and flute. It is an upbeat piece, almost jazzy at its peak, leaving you with the impression that Rhayader is quite happy with his reclusive lifestyle. "Rhayader Goes to Town": The townsfolk react coldly towards Rhayader with his physical deformities. But he carries himself with a noble bearing. This is the longest piece on the short album, illustrating the hubbub of town on a busy shopping day with Rhayader going about his business in a stately, dignified fashion. The bass is jazzy for most of this track, and listen for Andy Latimer's incredibly musical, uncomplicated guitar work. It was this piece that first elevated him into the ranks of one of the top 20 guitarists of all time. In a recent interview Latimer commented on how he will focus on getting just the right sound out of one note � and he represents the standard for simple, beautifully emotional guitar work. "Sanctuary": Rhayader frequently rescued injured birds and stopped anyone from shooting them on his property, providing sanctuary for them over winter before they migrated north in spring. A short piece played on just one electric and one acoustic guitar. The album's main theme is played in long, soulful, crystal clear notes, evoking images of peace and sanctuary. It flows directly into the next piece � in fact they are better seen as one piece, developing a similar theme over 2 minutes. "Fritha": Fritha is a shy young girl from the fishing village. A similar theme � contrapunctal to the previous one � now played on flute, a dual-textured synthesizer, and acoustic guitar, with very gentle bass backing. Still very soft, still without percussion, elegantly complex toward the end. "The Snow Goose ": A rare Canadian Snow Goose is swept off course by a sea storm and just reaches the Essex coast, where Fritha finds her exhausted and wounded on the beach. She has heard about Rhayader's ability to heal birds, but is frightened by his deformed appearance when she first meets him. Her concern for the Snow Goose overcomes her fear. Led by Latimer's lead guitar, again playing soft beautifully melodic passages, and backed by and Hammond organ and that prominent, jazzy bass. It alternates seamlessly between 2 themes, but the backing instrumentation and the key change subtly, and the almost imperceptible introduction of synth and percussion develop one of progressive rock's most memorable pieces. These tunes will be repeated and reprised throughout the album. "Friendship": While the Snow Goose gradually gains strength, tended by Rhayader and visited by Fritha, a strong bond of affection grows among the three of them. Another very short piece, with an upbeat tempo, led by a woodwind chamber quartet. "Migration": Now fully healed, the Snow Goose follows her natural instincts and migrates north. A 2 minute piece with bass guitar, staccato synths and male vocals (no lyrics). You can imagine the Snow Goose taking off, spiraling ever higher, and eventually heading north as the happy music fades. "Rhayader Alone": With the departure of the Snow Goose, Fritha no longer visits the lighthouse and Rhayader is again alone with his painting and the melancholy sounds of the marshes. This is a very emotional minor-key reworking of the earlier "Rhayader" track. Again led by that crystal clear, slow, emotional guitar, backed by delicately muted keys and bass. Knowing its place in the story will bring a tear to the eye. "The Flight of the Snoow Goose": One day high above the horizon the familiar shape of the great white bird appears � and Rhayader calls for Fritha. You can imagine the Snow Goose's wings flapping as the music grows louder with a long intro made up of two repeated motifs. Then enter fuzzy guitar, bass and drums. The tone is positive and the tone strong as Rhayader and Fritha celebrate the return of the Snow Goose. "Preparation": June 11,1940. Fritha and Rhayader are older now. Thousands of allied troops are cut off from land retreat by the Germans. Every civilian craft in England is called on to rescue soldiers from the sea and hundreds of civilian volunteers cross the channel in their small boats. Miraculously, the weather is clear and the notoriously choppy English Channel is calm. Rhayader gets ready to sail with the small fleet to help in the desperate rescue. Here a grim, determined tone is set by the keys and bass with woodwinds, followed by a chorus of ghostly female vocals and a deep pealing. An introspective track that suggests a melancholy, foreboding mood. "Dunkirk": As Rhayader departs, leaving Fritha behind, the Snow Goose follows him over the channel and into the battle. At just over 5 minutes, this is the second longest track. It starts with organ over bass, very dark and menacing, with guitar, and brass passages interspersed. It develops into a tense and dramatic piece depicting horror of war � heavy percussion mimicking gunshots, urgent military snare drums, fuzzy bass sounding like diving Stukkas, and a high, wailing synth representing the emotion and fear. Listen for the exchange of leads among the synth, organ, brass and guitar. "Epitaph": Rhayader ferries many stranded soldiers to safety, and the soldiers he evacuated describe a bird circling his boat while he struggled through the choppy waves. But tragedy strikes and Rhayader is gunned down. He was later found by Bill Oudener, a naval reservist. Oudener had been about to sail into a floating mine when Rhayader's boat caught his attention, but from the wreck they were able to spot the mine and blow it up before it killed anyone. It was as if Rhayader had died to bring life to others. The Snow Goose is seen circling over the spot where the little boat went down. The melancholy church bells and the spacey synth sounds make it clear that a soul has passed. The tune is a development of "Preparation", 2 tracks earlier. "Fritha Alone": Waiting for Rhayader's return. Another short piece, led by Pete Bardens's piano, quiet and very melodic. The melody is a reprise of the synthesizer tune in "Fritha". You can almost see the lonely girl standing on the lighthouse looking out to sea. "La Princesse Perdue": Fritha senses that Rhayader has died and sees the Snow Goose returning. She follows her princess's flight home, sees her land, only to fly away again forever. At nearly 5 minutes this the musical conclusion to the album. As with any good composition it takes all the loose ends from earlier pieces, and ties them up neatly by re-examining many of the themes introduced earlier in the album. It begins with a violin-driven motif that recalls "The Flight Of The Snow Goose" then quickly moves into a complex piece made up of many parts, led by synth but introducing a rich mix of instruments including Latimer's guitar with that bittersweet tone. The final track, "The Great Marsh": Life continues on the marsh. This almost is the exact inverse of the introduction to the album, although the choral vocals are now replaced by soft woodwinds, the waves lapping the shore are assisted by muted cymbals, and an electric piano now plays the 2-note motif that softly fades out as the same waterfowl cry in the background. And you are left with the impression of the sun setting over the marsh, and nature quietly carrying on regardless of the human drama that has passed. In true classical style, you will hear many themes reprised or reworked across the album. "Fritha" is reprised in "Fritha Alone", "Rhayader" in "Rhayader Alone", "Preparation" and "Epitaph" share a common theme but with very different moods, "The Great Marsh I and II", "The Flight Of The Snow Goose" and "La Princesse Perdue", etc. In 1975, I was a Benoni High School senior who had 6 years of guitar under my narrow belt, a high school band, 5 years of piano lessons, and was dabbling with classical guitar � and thought I knew all about music. But The Snow Goose was an epiphany, evidence at last, of a perfect blending of classical and modern music. If you think of The Snow Goose as a modern piece of classical music, you will be way ahead of music historians � who will surely make that declaration at some time in the future. And as I re-play the album while writing this and the strains of "La Princesse Perdue" give way to the pastoral "The Great Marsh", I am left with just one thought: "Dear God, this is simply beautiful".